Islands devastated by Hurricane Irma earlier this week received a small measure of good news on Saturday, as it appeared that Hurricane Jose, a powerful Category 4 storm, would stay largely to the north of the Leeward Islands, sparing most inhabitants from its worst effects. As of Saturday afternoon, Jose remained a hugely destructive storm, with maximum sustained winds of 145 mph. But its northward track means that hurricane warnings for Saint Martin were downgraded to tropical-storm warnings, and tropical-storm warnings were discontinued for the smaller islands of Saba and St. Eustatius. Barbuda, Saint Martin, and the U.S. and British Virgin Islands may still experience heavy winds and rain but not the storm’s full fury. This was a meager consolation for places rendered all but uninhabitable from Irma, which hit some of the Leeward Islands as a rare Category 5 powerhouse. And the threat of Jose still hindered relief efforts, delaying the chance to reach people who needed food and water, or even take account of the storm’s death toll. 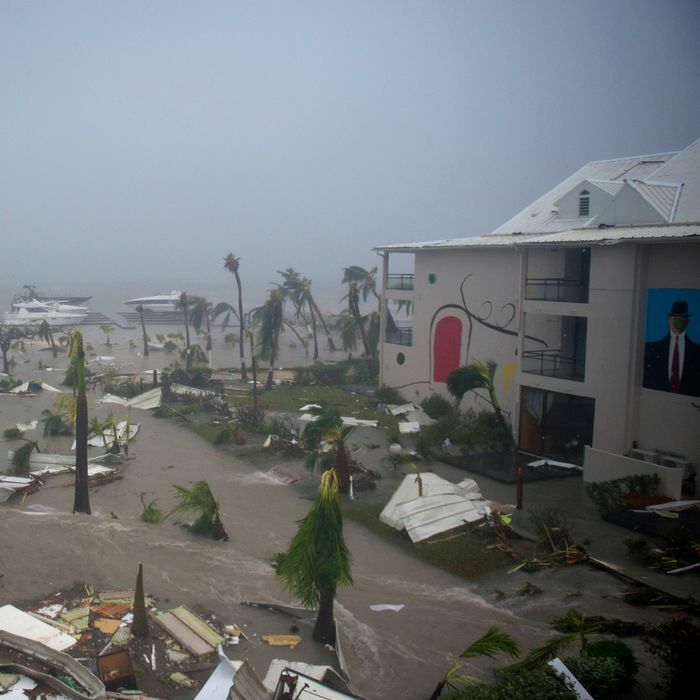 On Barbuda, the smaller of the two islands that make up the nation of Antigua and Barbuda, almost every structure sustained severe damage, and all 1,700 residents had been evacuated to Antigua in anticipation of Hurricane Jose. One person, a two-year-old boy, was left dead. Saint Martin, which comprises Dutch and French overseas territories, was flattened by Irma; video conveys the sheer level of annihilation. The Dutch government said that 70 percent of the homes on its side of the island were badly damaged or destroyed, and that looting had broken out before Dutch military personnel arrived. U.S. military aircraft evacuated more than 500 Americans from the island. Other islands in the area, like the British Virgin Islands, saw extensive damage from Irma as well. At least five deaths had been reported there. Cuba sustained a major hit as Irma passed over it on Saturday, but it was too early to say how much damage the storm inflicted. To make matters even worse, communications on many of the affected islands were still spotty days after the storm, leaving many agonized relatives and friends elsewhere to wonder how their loved ones had fared. This post has been updated to reflect forecast changes.